5000 CA-75, Coronado, California, United States. 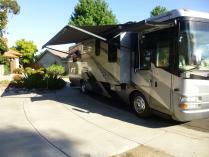 This rental is for a Luxury Class A RV that sleeps 5 adults comfortably. I will deliver and setup the Coach at your rented space at any of the San Diego Beaches campsites or other areas in San Diego County. You are required to make a camp site reservation. Be sure the site will accept a 35 foot coach. There are many beautiful campsites on the beach at Silver Strand Camp or in the mountains in San Diego County. The RV comes fully equipped kitchen, coffee maker, bathroom towels , soaps and bedding. The RV has (2) smart TV's Blue Ray player and surround system. There is also a stereo in the storage compartment for listening outside. There is also an electric canopy to shade the space in front of the RV and it also includes ground covers to keep the space in front the the RV clean. If needed I can stock the refrigerator with food for your stay. The RV is well kept and very clean. If the coach is returned clean I will refund you cleaning deposit. You are required to remove your shoes at the door to prevent tracking dirt on the carpeting. If there are stains on the carpeting you will forfeit your cleaning deposit. No Pets, No smoking in the RV, Sleeps a maximum of 5. Generally only (1) additional vehicle is allowed. If more than (1) vehicle parking must be worked out with the campground. there are (2) air conditioners but the RV must be attached to a 50 amp electrical system to operate both units. You rarely need both AC units running due to mild climate in San Diego area.